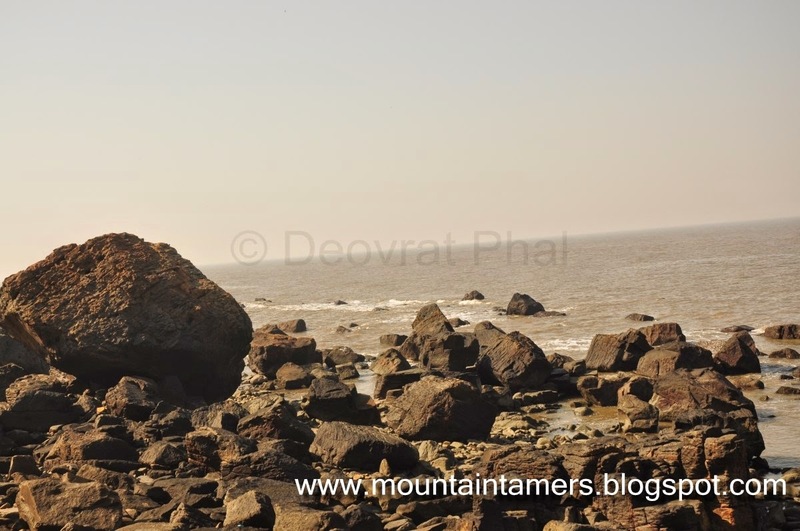 It was Rangapanchami (रंगपंचमी) on 7th March and in order to avoid the wild, drunken and boisterous celebrations around the city, I decided to join Amey and others on a climbing trip to Manori Beach near Gorai. I met Amey at Gorai Jetty at ~ 8.00 AM and we set off to our destination. Swapnil Jadhav, Shyam Thanawala, Ganesh Shinde and Varhad were waiting for us there. Later Rahul Patil, Neha More, young Kartik, PC and tai also joined us. This time we even managed to climb the overhang route. I climbed that on my second attempt. Swapnil left us transfixed with his jaw-dropping dyno. Everyone climbed till the heart was fully contented. We even celebrated (peaceful) Rangapanchami here. PC had purchased the colors while on his way here. Everyone's target was young Kartik Ayare. God knows how many times he entered the sea to wash the colors off his face. Climbing at Manori -- Deovrat Phal from Deovrat Phal on Vimeo.